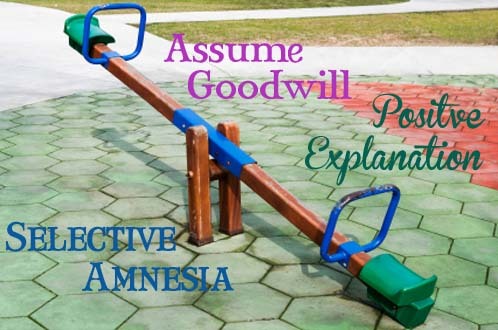 I’ve written about my ‘Assume Goodwill‘ philosophy and my ‘Selective Amnesia’ trick to help sail me over rough patches. To that quiver of emotional arrows, I add ‘Positive Explanation.” If someone says something negative towards me, or slights me in some way, I’m generally apt to say (either to myself or whomever I’m with), “Well, maybe (insert excuse and explanation here) they’re having a bad day/traffic was horrendous for them/they didn’t understand what you said”. This is very close to ‘Assume Goodwill’ but it goes one step further by helping you walk a mile in the other person’s shoes. Psychologists also refer to this as “reframing.” Your explanation might be wrong (in fact, it probably is) but it sure helps to reframe the situation (and thus diffuse hurt feelings, anger and resentment). Interestingly enough, giving yourself a reason for someone elses’ poor behavior (even if the reason is not valid), puts you into an automatic response pattern that is more sympathetic than if you tell yourself nothing or instead, spin a wildly fantastical negative story (the work on this by Robert Cialdini is summarized here). In the end it comes down to something very simple for me; I only have 17 waking hours in a given day. I don’t want to waste a moment of them making up stories in my head about what someone else thought, did, or said. Life is too short. My goals are too big. And I’m happier living resentment-free with Positive Explanations to surround my interactions. Previous Post: Cold Process and Customer Service! Next Post: Double Feature SoapyLove Ice Pop Soap! This was a great reminder post not to waste time and worry on things and people you can’t change. I needed this! It is great to know there is a genuine person behind a company like Bramble Berry. You have a great business, but you also share so much knowledge with us. You can’t put a price on that!! Thanks Again! I nees a great portion of that selective amnesy and positive explanation plus good will. I’ve spent the last two precious hours being angry with a silly comment written to one of my posts and I’m more angry with myself, not being able to bring my emotions under control and discipline and concentrate on my work. Good that I could come back to this post and receive positive energy. Anne-Marie you’re a precious writer. I wish you enjoy the week end with that marvelous family of yours. Oh yes, those anonymous comments are horrible to deal with aren’t they? Or just hurtful comments. I really notice that when people can sit behind their computer, and not be held accountable for what they say, that often, the discourse quality lowers. I think I’m out of funny colors, all I have at the moment are decent, businesslike colors, I’ll run to the drugstore and buy at least 3 crazy colors. I pick the selective amnesia, lol. We already know that the brain can forget things when it gets crowded in there. Why not try to put the bad stuff to the front of the DEL line?? Thankyou Ann-Marie! Makes us all think! I just read the post and it really hit home for me. Just because someone thinks it happened that way doesn’t mean they’re right. Thanks for the quotes they were great. This is all so true. It seems so easy to forget that carrying around negative baggage hurts us (the baggage handlers) more than anyone. It’s always good to have positive thoughts spread about, thank you. I recently discovered your site and always enjoy your delightful posts. And it’s funny that you posted this now coz I was just watching ‘You can heal your life’ by Louise hay. I think more people need to watch it to help wake them and bring awareness. I always say, “The world would be a better place if everyone realized everyone else was a person too.” Working in retail can be… tough. You are a bigger person than I. When similar happened to me, I was not going to apologize for something I did not intend and was made up in someone else’s reality. The reframing and decision to not respond would have in hind sight been the better strategy. Thanks for sharing. Just know other folks have gone thru this makes me feel better :-). I am not alone! There are peacemakers and they are the ones who put others first. Then there are those that are consumed with self and what they did or did not get. Anne Marie, you are definitely a peacemaker. I think they say that people only understand about 7% of a conveyed idea in its written form, thus making it easy for people to get the wrong idea. The second group from above automatically draws up perceived injustices. The rest move on and never think of it again. Way to think on the positive. If people like you ran the world we would never have any war. I whole heartily agree!!! You said it right and so eloquently! I’ve forgiven her, but it still hurts not having a close friend to confide-in, share memories with, etc. “chewing” on an issue that has been bothering me. I needed to re-direct . You are so smart Ann Marie ~Cheers everyone ! Great job of putting positive ripples out there, and a nice read to start the day. Keep dreaming your dreams and pursuing them. And keep sharing these kinds of thoughts! Loved this! I had to read it a cople times because there are so many good nuggets in there! Thanks A-M! Great Post. Don’t let anyone rob you of your joy. You’re right!!! You have to go straight to your goals with positive feelings. We don’t have to waist time in people that don’t deserves you. This was a great post. Well said. It brings to mind something called the “Fundamental Attribution Error” in social psychology. Wow, it’s been a few years since I heard that term! 15 I think? College! =) Thanks for reading. I have done that but did not know it was called “reframing”. Thanks for the education. I usually end it with a little prayer in my mind and let God take care of the person that may need his help and guidance. Thanks Mariah! And yes, the world would be a much better place – more restful and peaceful for sure. I sat back with a coffee this morning and read your blog post. Although I love what you write and always in clever business-like detail, it was one part in particular that made me sit up and take notice. That was, not to spend any of our precious time on ‘unscrupulous’ behaviour. We do only have a certain amount of hours in the day to cover and will never win a battle with people who feign something. It’s hard to back down sometimes, but taking the higher road, re frame and diffuse – makes you the stronger woman we all know and trust. Your time is worth bottling! Great post, my sister and I went through something recently similar to this and chose to move on. I love that quote you posted too. Thanks – and glad your sister and you took the high road as well! I love the wonderful feeling that you give everything and that it is a conscious choice that you make. It shows in all areas of your life and is a wonderful inspiration! Even this awful situation has been turned into a wonderful teaching moment! Just a small thanks for all you do! Thanks Dianne. You’re right, everything IS a learning opportunity, even the things that look bad on the outset. Sometimes, they take a while to reveal the positive lesson, but they’re always there. Your article is exceptional and I was pleased to see how you handled it. I too am working in this direction of addressing it and then moving past it as quickly as possible. What truly helped me work this out in my head the best and I have been applying the philosophy since I read it, is a book by Joel Osteen, Every Day A Friday (How to be happier in 7 days). This book was truly a blessing for me. I walk through each and every day with a smile on my face and it shows in how I interact with others and with my customers. I am simply HAPPIER! Aw, that positive comment means a lot coming from you! =) I haven’t read Joel’s book but it sounds like a great one for me to add to my ‘to read’ list. Being happier every day is something we can all strive for. These are all wonderful techniques thank you for sharing them! The one I use is, oh perhaps they haven’t eaten (can cause a really bad mood/day)! A plausible explanation works too. I’ve been working hard on this for a long time now- it’s amazing how your day-to-day attitude is changed for the better. Giving people a sort of “get out of jail free card” helps me to see the good in them and not to question them or their motives. It saves time and stress and makes us more refreshing people to be around! It’s also amazing how people come to trust and feel comfortable with you when you make this a practice! They hear you trying to find the positive in a negative situation or person, and they know you’ll do the same for them, rather than being snippy or backstabbing the second they are out of earshot. I agree – it so helps your stress levels when you’re not telling yourself negative stories about other peoples’ motivations and reasons for their actions. Well said! Loved your post:)Throughout the past few years I’ve tried re framing myself and your right Life is too short and my goals are also too big! Thanks for sharing! Wow, you said that well. I am sorry that has happened. I am so thankful for all that you put out there and share with all of us. Graditude is what comes from me. Keep up the good work!!! It could be an older/wiser thing or it could be that it seems to be a hot discussion in positive psychology lately. =) Either way, it’s a great idea – and I’m really liking practicing it and are glad you are as well.